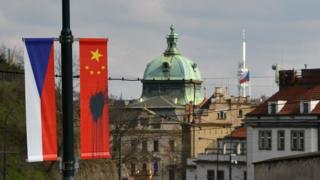 Chinese flags hoisted in the Czech Republic ahead of a visit by Chinese President Xi Jinping have been defaced. Dozens of the flags hung in the capital Prague were "spattered with a black substance overnight", a police spokesman said. The Chinese leader is due to arrive on Monday for a two-day visit before going to the US for talks on nuclear issues. Czech demonstrators who oppose China's policies in Tibet are expected to stage protests during the trip. They also plan to hang a giant photo of exiled Tibetan spiritual leader the Dalai Lama near the airport alongside one of former Czech President Vaclav Havel, a former dissident and human rights activist. Rights groups have accused China of suppressing Tibetan culture and freedom of expression. The Chinese government says Tibet's economy has developed considerably under its rule.